Apple has decided psychic healing has no place in the App Store, despite last week approving a "distance healing" application for warts available for only $12.99. 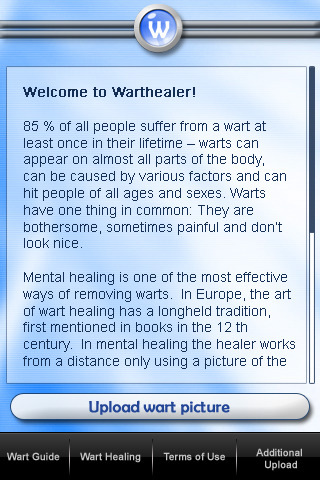 The faithful who bought a copy of Wart Healer were asked to take a photograph of their wart which is sent to the "professional mental healer", who spends the next 111 days thinking about it after which "first effects are visible". The application was approved on 22 April, as reported by Kr Apps, but pulled this weekend with the traditional silence from Apple. Not that the removal of Wart Healer leaves the iTunes store bereft of quack science. Most of the worst offenders hide behind the "Entertainment" category, but one can still find aura-reading applications for uncovering one's previous, and next, incarnation in "Medical". Nip over to "Health & Fitness" and you'll find lots of mystical help, including "a crystal healing bowl that excites your chakras". Be patient. The healer starts working during the moon's next decreasing phase, and first visible effects can take up to 111 days.